Our Wildlife Experts can also provide, clean up of animal waste as well as corrective and preventive repairs for your protection. Contact your local office for details and qualification in your area. 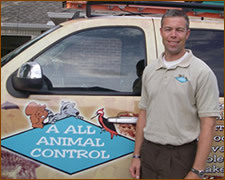 A All Animal Control, a Nuisance Wildlife Management company is a leader in providing wildlife, animal and pest control services and removal for residential, industrial and commercial clients. While protecting your home or business from wildlife and insect pests is part of our service, we also have skilled craftsman that can perform a variety of exclusion and repairs inside and out! What sets A All Animal Control apart from some of our competitors is that once you join the team, you are a part of a family of professionals that work together to help each other and share common goals. 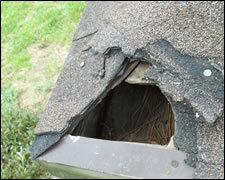 Wildlife in the home or office can do serious structural damage. Animals destroy electrical wiring, phone, cable, computer lines and security systems. Wildlife can also be carriers of disease such as rabies, distemper and many other serious diseases. 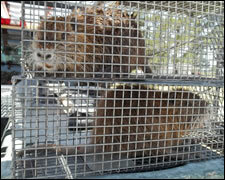 Our area of expertise is LIVE animal removal and relocation. With our experienced technicians, you can be assured of receiving a safe, effective and humane solution to your animal problem. 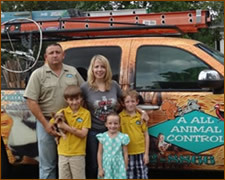 Professional control and removal of Raccoons, Squirrels, Skunks, Foxes, Rabbits, Groundhogs, Deer, Geese, Sparrows, Starlings, Pigeons, Bats, Snakes, Mice, Rats, Armadillos, Moles, Woodpeckers, and More!